The job market is picking up, and workers are increasingly jumping ship. 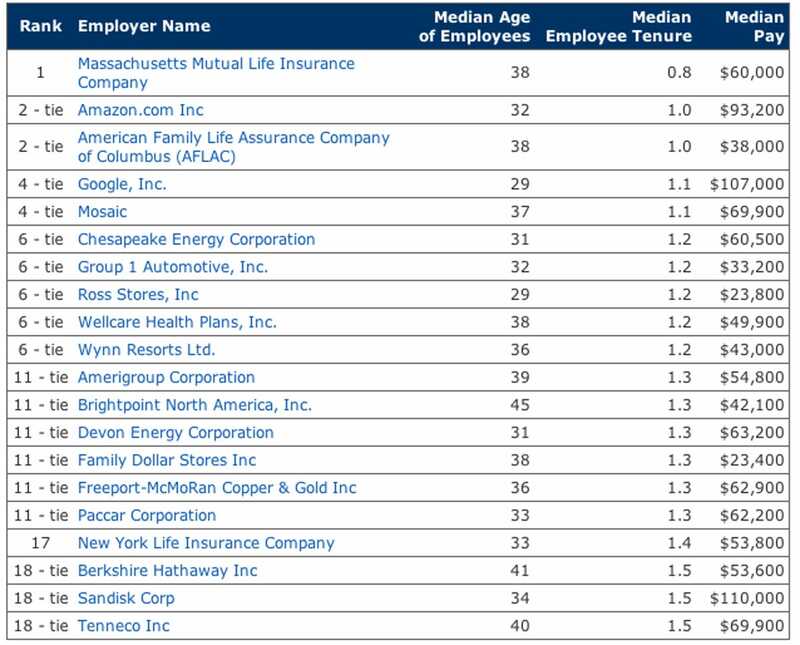 A new Payscale report published on Thursday ranked Massachusetts Mutual Life Insurance Company as having the highest turnover rate out of all of the Fortune 500 companies. 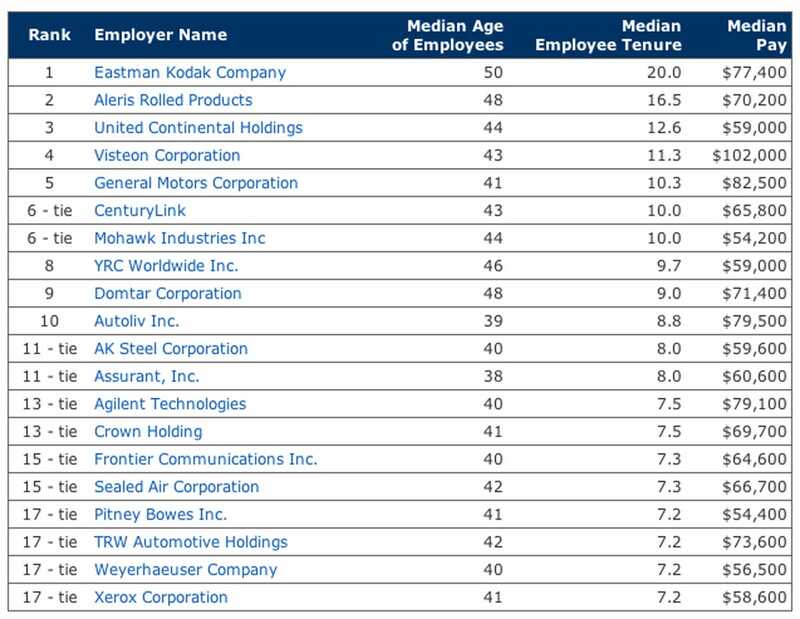 Average employee tenure was a little over nine months. 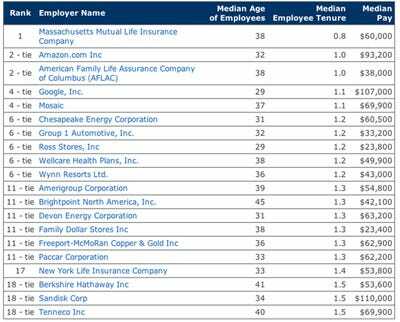 Other companies with high turnover include Amazon, AFLAC, and Google with employees sticking around for an average of one year. Although high turnover may cause alarm for employers, Katie Bardaro, lead economist at PayScale, told Business Insider it’s not always a bad thing for the job market. According to the report — titled “Companies with the Most & Least Loyal Employees” — companies with the highest turnover are mostly in retail and information technology industries. For retail, Bardaro attributes low retention rates to the industry’s mostly younger staff. As for the high turnover in technology, Bardaro said that’s just because the industry is hot. 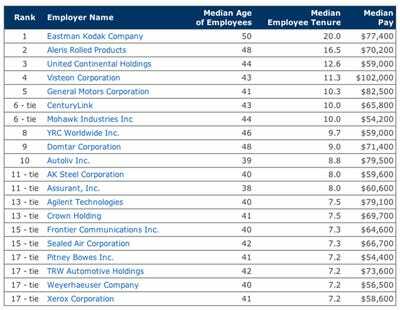 On the other hand, Eastman Kodak tops the list as having the longest average tenure for employees at 20 years. Manufacturing companies tend to have workers that stay the longest. Bardaro said this has a lot to do with an older age group typically working in these industries. “Although it has taken some hits, manufacturing hasn’t done too poorly,” she said. While the report looked at how long the average employee remained with a company, tenure is not the same thing as loyalty. Payscale’s report recorded data collected from 250,000 people working at Fortune 500 companies in the past year (July 1, 2012 to July 1, 2013).